EDMONTON - Alberta Premier Alison Redford's plan to borrow billions for infrastructure is so underfunded it will take until the end of the century to pay it all back, the opposition Wildrose party charged Monday. 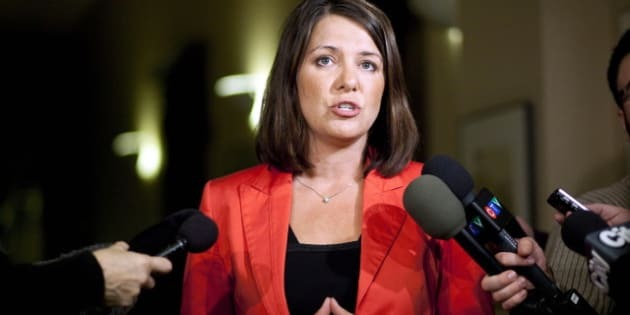 "The debt repayment plan that this premier is proposing (in the new budget) does almost nothing to pay down the $17 billion in debt," Wildrose leader Danielle Smith told the house during question period. Smith noted that the budget, presented last Thursday, allocates $205 million to debt repayment by 2016, when the balance of the $17 billion will be borrowed. "It's kind of like making the minimum payment on a credit card," said Smith. "Does the premier know that if she only pays the bare minimum, it will take 85 years for her to pay off her $17-billion debt? "Is this what the premier meant when she called this a budget for the generations?" Finance Minister Doug Horner told the house that the Wildrose numbers are misleading, given that the money and payment terms haven't been set. He said when the money is borrowed there will a plan to pay it back in a timely fashion. He pointed out that $1.1 billion already borrowed to twin the highway to Fort McMurray is earmarked to be repaid in two decades. He said there will be a similar plan with the rest of the $17 billion. "We have a debt retirement plan. We're going to set dollars aside. (Smith) should do her homework and read the budget," said Horner. Last week's budget announced the government will borrow $4.3 billion this year to pay for infrastructure in a province whose population is growing by 100,000 a year. That borrowing figure will rise to $17 billion by 2016. The province plans to pay $40 million this year toward the principal, $112 million next year and $205 million by 2016. Smith said the payment plans need to be more aggressive, adding that at current rates the government would owe $600 million in interest payments on that debt by 2016 — three times what the current budget plans to put down on the principle. Redford told the house Smith will soon have her answer on the government's debt repayment plan. "The answer to the honourable member's question is that a year from now we're going to have more schools, we're going to have family-care clinics, we're going to have hospitals, we're going to have roads, we're going to have irrigation systems because that's what builds Alberta," said Redford. "It is a long-term view. It is for generations to come." NDP Leader Brian Mason said Redford has broken key pledges for long-term sustainable funding for health and for grade school education, has reneged on hospital expansion in some centres, and is cutting programs for seniors. "It's amazing to me how the premier can break almost every promise she made and stand in this house and say that she kept her trust with Albertans," said Mason. Redford they did their best to mitigate the impact on Albertans, given that falling oil revenues led to $6 billion less revenue than the province had expected to take in this year. "We were able to ensure that we did not make across-the-board cuts, that we did not raise taxes, that we invested in a savings plan, that we protected vulnerable people and we continued to build this province," said Redford. The budget holds the line on spending but still forecasts a $2-billion deficit along with the $4.3 billion in borrowed money. Post-secondary institutions saw their $2 billion in operating grants cut by almost seven per cent. Liberal Leader Raj Sherman said Redford was shortsighted to cut funding to the educational institutions she hopes will train the people needed to diversify the economy. "Student leaders tell me that your deep cuts will negatively impact class sizes already so full that students have to sit on the floor. And when they graduate, they have an average debt of $27,000," Sherman told the house. "How is that helping Alberta prepare for the future?" Redford said it's an evolving process. "There's no doubt that doing things differently is sometimes challenging for people to understand."